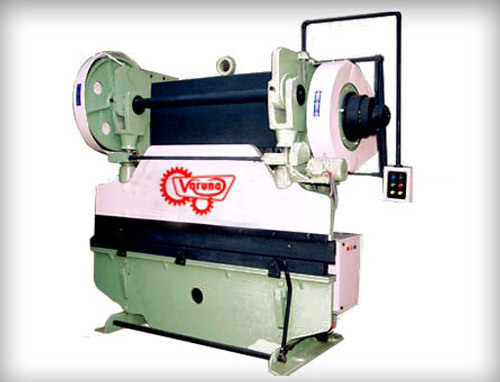 Ravi Sons World Wide manufactures and exports Mechanical Press Brake to its wide array of clients across India and abroad. Steel frames and plates are being used in manufacturing the range of mechanical press brakes. We manufacture such machines while designing in interlocked construction by way of a bed directly supporting on the side walls. This arrangement is put in to ensure accuracy and perfect alignment. Moreover, our array of such products is integrated with a high torque, connected with heavy duty brake arrangement to make sure highest transmission of torque and power. Our range has also been designed for simple control of the ram speed and for recurrent starting and stopping of the machine. Press Brakes manufactured and supplied by Ravi are best available in the machines and tools industry today. Ruggedly built with features for the most demanding and challenging work. The Press Brakes manufactured at Ravi Sons World Wide offer quality output with a competitive edge that impacts the bottom line of any organization. Press Brakes are manufactured for continuous production & accuracy. The rigid frames are manufactured of tested plates. The interlocked construction with the bed directly supports the sidewalls ensuring consistency, accuracy & perfect alignment. The Mechanical Press Brake are designed for easy control of machine speed and for frequent starting and stopping. The clutch is readily accessible and adjustable easily. Gun Metal Bushes are provided in all running parts.